We all know that it is almost impossible to sit out on the patio without the nuisance of mosquitoes, bees, and other insects. Wouldn’t it be nice to never have to worry about this again. Dreamscreens Motorized Screen systems have eliminated this problem along with a few others all at the touch of a button. Our screens systems will diminish the wind and rain, protect you from the suns’ harmful UV rays, provide privacy from your neighbours, as well as extend the use of your outdoor space in the spring and fall with an outdoor heater. You can create a whole new outdoor living space that invites cool breezes in, with the safety of a bug free environment. 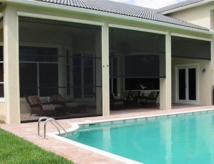 Dreamscreens Overhead Screen Systems are a powerful solution for large applications: Covered Patios, Under Decks, Porches, Lanais, Balconies, Terraces, Gazebos, Bi-Fold Doors, Nana Walls, Shading on Picture Windows, or converting a Garage into a workshop or playroom. Our Motorized Screens are available up to 24 ft wide, and up to 16 ft high. Rugged design features exclusive “Wind Bar” bracing technology, to withstand high wind loads and impacts. The windbar also helps create tension on the screen fabric from side to side resulting in a consistently ‘taut’ screen. The longer the screen remains taut, the better it will roll up and down and the longer it will last. Dreamscreens Exclusive Mesh Lock Track design has an automatic release feature to prevent your screen from tearing. The vertical tracks, which guide the screen up and down, contain thousands of tiny bristles that criss cross through the screen to hold it in place. The benefit of this is that if you accidentally fell into the screen, the dog jumps up on it, or there is a big gust of wind instead of ripping the screen releases. To fix it all you have to do is bring the screen up and it will automatically self correct back into the track. With Dreamscreens, if you ever have an accident (which is the only way to damage our screens) and have to replace the screen, you only need to replace one panel. As long as it is on one of the bottom two panels, replacing the screen will only take 20 minutes. All you have to do is angle the bottom bar and windbar out of the track, unscrew and slide out the screen (with the cigar hole) and slide in the new screen. It is as simple as that. Your choice of four standard colours . Custom colors also available. Provides insect free ventilation and enhanced privacy/shading with a variety of screen material options. Designed to be installed flush inside an opening, on the face or surface of an opening, as well as recessed into a column and totally out of sight. Remote controlled convenience is standard, opens & retracts with the touch of a button. State-of-the-art externally programmable low-profile Somfy motor that not only operates but adjusts its settings by remote control. Retracts into its own housing when not in use. Sturdy construction for years of trouble-free operation. Complete ventilation with the safety of a bug free environment. Limited life time warranty for your peace of mind. 5 yr warranty on motor, which Somfy suggests should last for 15+ years.